We all know that VLOOKUP can find first match and return the results. 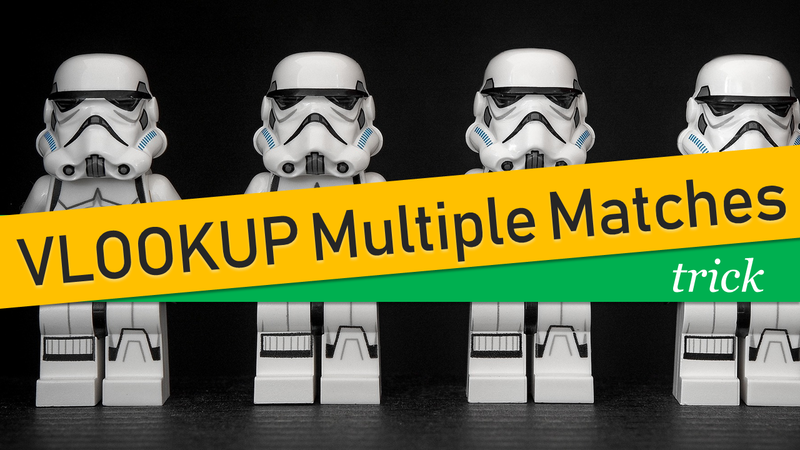 But what if you want to VLOOKUP multiple matches? Use this simple trick instead. The problem is simple as illustrated below. Say you have a bunch of dates & locations. You want to find out corresponding date(s) for a location. If you use either VLOOKUP or INDEX+MATCH, you just get the first date, but you want them all. In new version of Excel (2019), you can use awesome formulas like FILTER() to do exactly this, but most of us are still stuck in older version of Excel. So how to get all the matches? TEXTJOIN is a text combining function available on Excel 365. We can it to solve our multiple matches problem. Let’s say our data is in a table named plan. We want to lookup the location in cell G7 and return all matching dates. We can use below TEXTJOIN formula (you must press Ctrl+Shift+Enter) to get result as this is an array formula. How this multiple match formula works? Let’s go from inside out. TEXT(plan[Date], “dddd dd-mmm”) this part takes all the dates in plan table and converts them to dddd dd-mmm format (ie 18/05/2019 becomes Saturday 18-May). The end result would be another array of dates formatted. Why bother with TEXT(plan[Date], “dddd dd-mmm”)? If you don’t use TEXT() to convert your dates, you get something like this instead – 43603, 43604, 43605. This is because Excel dates are really just numbers. So when you use them in any formula you just get the underlying number value. This is why TEXT() formula is so helpful. Related: Top 10 tips for working with Excel date & time values. Not sure how all of this works? Check out below video to understand this trick in detail. You can also watch this on my YouTube channel. I made an example workbook with this formula technique. Click here to download or see this in action online here. As mentioned earlier, TEXTJOIN is available in Excel 365 or 2019 + only. So if you are using an older version of Excel, you should use one of the below techniques to get multiple matches. And yeah, while you are polishing your lookup saw, why not also read these..
How do you multiple match? Do you use TEXTJOIN() or something else? Or do you just give up after first match? Please share your lookup tricks in the comments box. 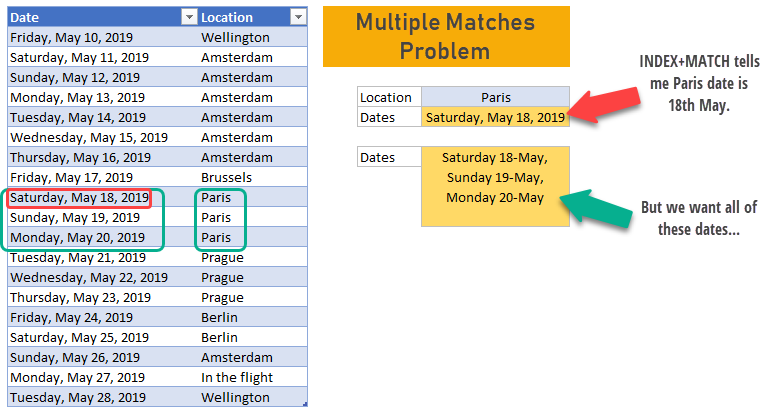 The post VLOOKUP multiple matches – trick appeared first on Chandoo.org - Learn Excel, Power BI & Charting Online.